Placed on 85 wild acres of land adjacent to the Seventh Day Adventist community of Angwin in rural Napa County, sculptor Richard Carter’s home and outbuildings probably don’t look that much different than they did when the property was originally homesteaded around 1903. 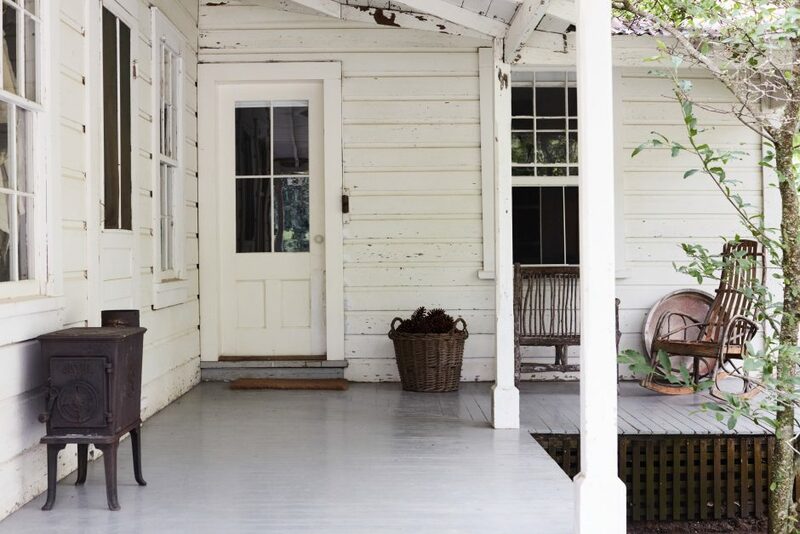 Restoring the property with an exacting eye to maintaining the dwellings’ original charm while slightly updating for modern efficiency has allowed Carter to create art from his home as certainly as he creates art in the studio. The screen porch makes for a serene dining area. Educated at the famed Kansas City Art Institute and mentored by sculptor Ken Ferguson, Carter is a nationally known artist who works in clay. His pieces, which incorporate stone and metal, rocks and nails, often tell dark narratives from the front lines of the LGBTQ community’s struggle to attain ordinary civil rights. 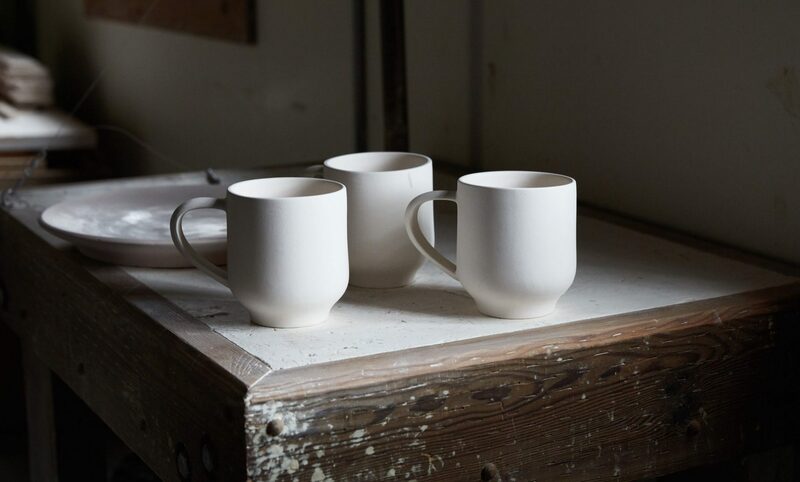 Fortunately for us, Carter still dabbles in the core practices of a ceramic craft and his kilns and studio also put forth the occasional gorgeous template for ceramic dinnerware. Richard at one of his kilns. 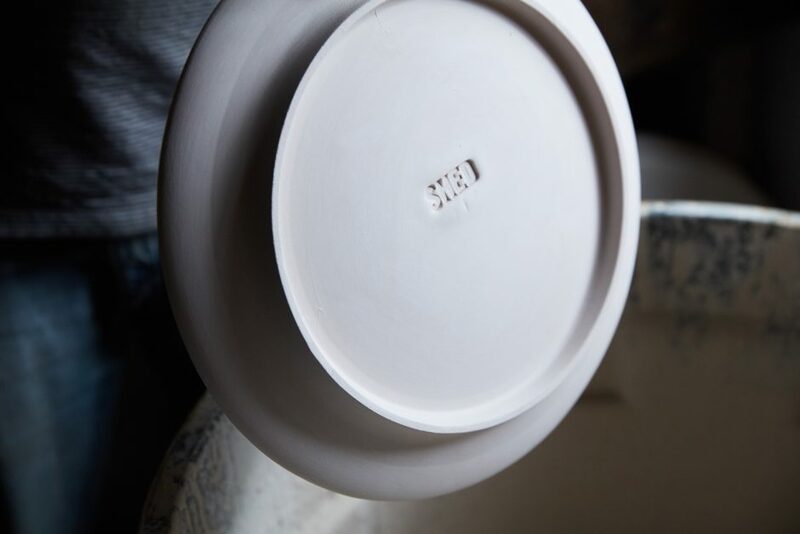 To that end, SHED co-founder Cindy Daniel commissioned the Richard Carter Studio to develop a line of dinnerware that could be used both in the kitchen’s restaurant and purchased for home use. 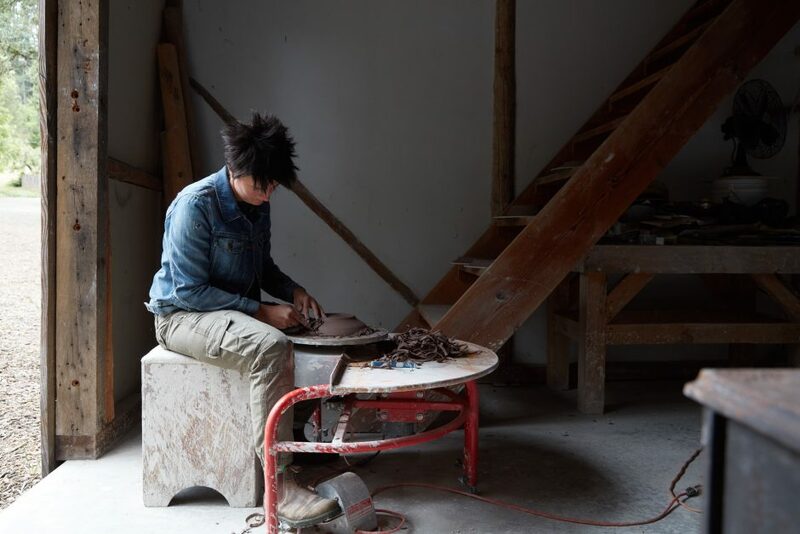 Working with ceramicist Chelsea Radcliffe, Carter and his studio mate, the artist Kelly Farley, have created a suite of plates, bowls, and even roomy mugs that will soon be used in the SHED Café and perhaps — your own dining room. Chelsea Radcliffe at the wheel. Cindy explains that choosing to work with Richard was a “natural” decision given a history of friendship and support. 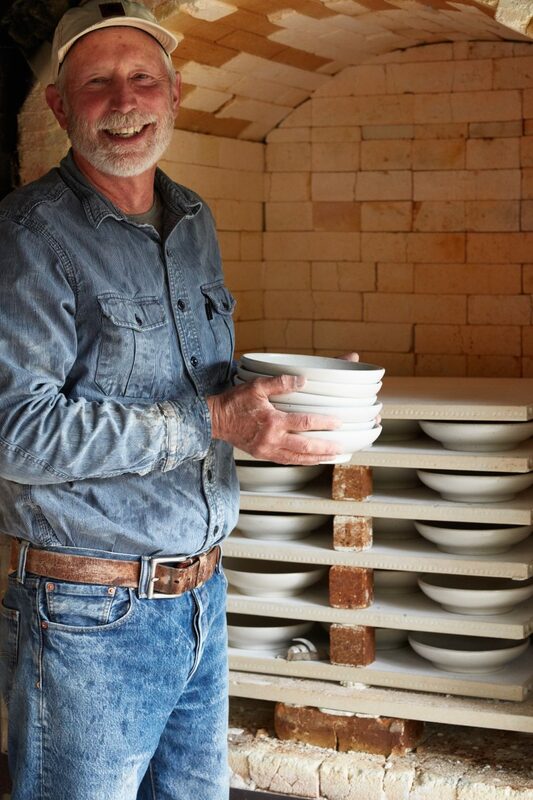 SHED has carried Richard’s iconic butler trays, as well as bowls, cake stands, and other pieces from associates of Richard’s since its doors opened in 2013. While creating a proprietary line of SHED dinnerware had always been an idea, Cindy says that it really sparked for her when chef Perry Hoffman came on staff as culinary director. The SHED dinnerware line provides a basis for exploration, featuring an 11″ dinner plate, a 9.25″ salad plate, a 2″ high and 8.25″ wide pasta/soup bowl, and 4″-tall mugs. 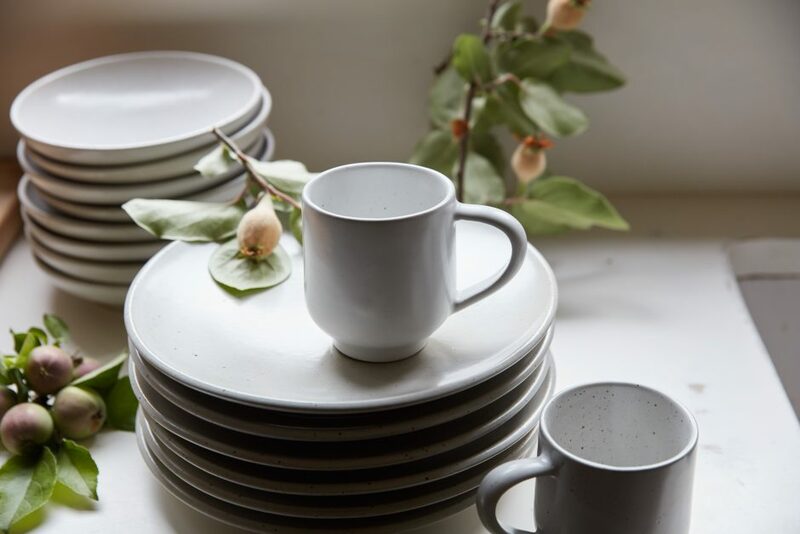 Lightly speckled, the SHED dinnerware line has a soft gray-white luster. Chelsea Radcliffe developed the original prototypes with Cindy, and once the heft and lip and weight and shape were right, solidified the design. Richard Carter and Kelly Farley utilized a 3D printer and a CNC mill to create molds that could be perfectly replicated. Kelly Farley glazes a mug at Richard Carter Studios. 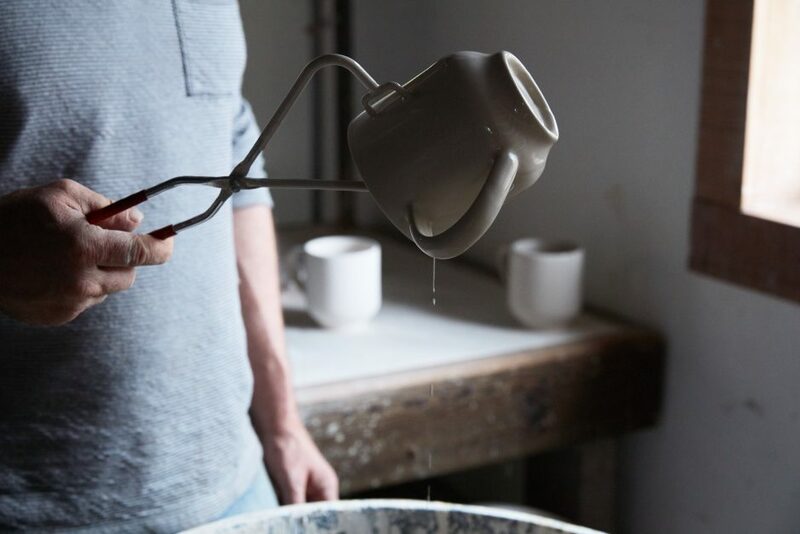 Perfecting the glaze — which is a true stoneware effect attained by firing with gas to 2,300ºF — is an art all of its own, and one for which the Carter Studio is renowned. As simple as this dinnerware line sounds, it marks a profound change. Cindy consciously chose not to have the Carter Studio create matching serving vessels or other dishware. 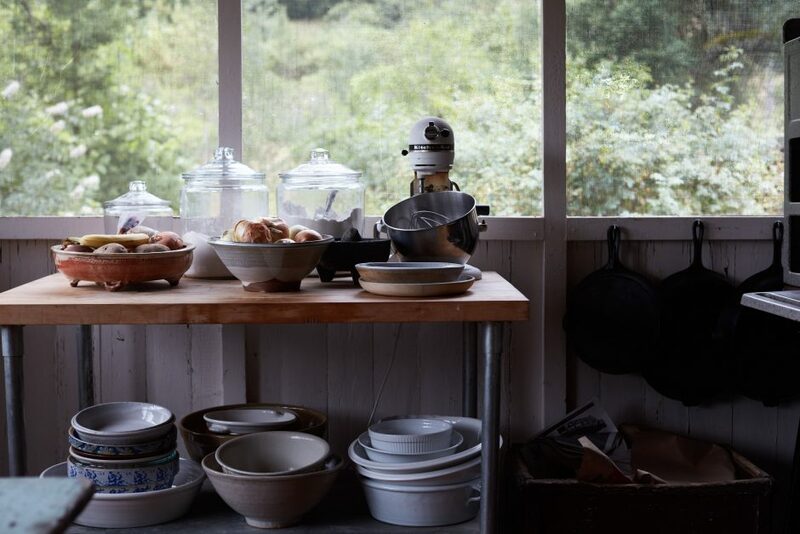 The dinnerware serves as a base point for everything else offered at SHED, all of it able to work together and apart. It also marks a transition for Cindy’s vision with SHED. A hand-pressed chop mark illustrates each plate in the collection. Our thanks to Seth Smoot and Kendra Smoot for photographing our dinnerware journey. This entry was posted in Meet the Makers and tagged artisan producers, ceramics, dinnerware. I’ve admired the dinnerware, appreciating it’s elegant, refined design. It’s informal enough for a casual farm table setting, yet equally at home on a linen tablecloth. However, I have a quibble with the soup/pasta bowl. Too shallow for soup or pasta. That farmhouse table or linen tablecloth would easily get splattered. Add some depth and possibly a rim and the bowl would be perfect. Just saying…. I bought several of the soup/pasta bowls and find them perfect for the types of foods we eat. We don’t use them for soup or pasta, but for everyday dishes like salads, rice bowls and breakfast bowls.